The start of this millennium brought drastic changes to the competitive landscape in the telecommunications industry. Companies saw diminishing revenues due to the passing of the Telecommunications Act of 1996. That act essentially deregulated most of the industry and forced incumbent local exchange carriers (ILECs) to open up their network elements to competing local exchange carriers (CLECs). Since barriers to entry were high, smaller CLECs were allowed interconnectedness to the ILECs existing network infrastructure and operate those loops at cost-based wholesale rates. That meant new, smaller companies could come in, use the phone company’s existing trunks, add some equipment of their own, and charge customers for telephony access at a fraction of what they were used to paying. So in 1996, you saw the formation of hundreds of CLECs offering voice, DSL, T1s, and other unbundled network elements (UNE) at a third of the traditional pricing model. I remember being inundated with so much advertisement back then. I didn’t realize that deregulation of the phone industry was behind the onslaught of new companies vying for my business. But with the dot com bust of the late 1990’s, most of those CLECs vanished practically overnight. Today, only a few big providers are left. XO Communications, Integra Telecom, and Level 3 are a few of the handful of profitable CLECs in the industry today. During the same time this decade, another technology was starting to take off with a rapid rate of consumer and commercial adoption. That product was Voice over IP (VoIP) and it used IP-based technology to carry audio transmissions over the Internet rather than the public switched telephone network (PSTN). With the proliferation of broadband Internet access in homes and at businesses, VoIP became a great alternative to the heavily regulated plain old telephone service (POTS). VoIP providers were chomping at the bits to grab their piece of the VoIP market. One group of such providers were the multiple system operators (MSOs), better known to many as the cable TV companies. The MSOs recognized an opportunity to use part of their bandwidth to create a compelling offer to customers. Since they already had a majority of the subscription-based TV market and a decent share of the broadband Internet space, horizontal integration into telephony was a natural business progression. They would be one of the first to offer a true triple play bundle service and market that to consumers at an enticing price. The lure of toll-free calling and enhanced voice services, discounted pricing, and bundling appealed to the MSOs’ existing customers and lead to the rapid access line loss faced by the telcos. Meantime, wireless providers were upgrading their mobile networks to handle more customers and new service features were being rolled out to subscribers. This meant more people were using their mobile phones as their primary phone. Telcos witnessed more and more of their customers “cutting the cord” completely. These two factors contributed to the deterioration of access lines that many of the ILECs did not see coming. To mitigate the landline loss to MSOs and other VoIP providers, telcos needed to upgrade their networks to compete. They were not only losing access lines, but could foresee their DSL penetration decrease due to the faster download/upload speeds offered by the MSOs and they own limitation of DSL availability (DSL is limited to customers within ~18kft from a central office/remote terminal before signal degradation). Fiber To The Node (FTTN) or the use of a fiber backbone to remote terminals have been around for a few decades, but bringing fiber that last mile to the customer’s premise or curb (FTTB) was an initiative sought out by the telcos to sustain their financial viability. MSOs were offering Internet speeds at the time at around 3 megabits per second (Mbps), about twice as fast as DSL speeds. Most MSOs followed a hybrid fiber-coax (HFC) network architecture, with fiber from their video hub to a neighborhood node. Content is distributed to customers via coaxial cable from the node. Upwards of 2500 subscribers are fed from that one node so network congestion became a problem when a lot of users are on the Internet at one time. FTTP was the solution to address bandwidth and distance limitations, bundling shortcomings, and to their foray into becoming a video content provider. Download speeds at up to 100Mbps, unmatched upload speed and a new video offering would lure customers to FTTP. In mid 2003, to maintain a common standard across the industry and to reduce deployment costs, Regional Bell Operating Companies (RBOCs) AT&T (then BellSouth and SBC) and Verizon agreed on common specifications for FTTP. They sent out Request for Proposals (RFPs) to major telephony equipment manufacturers and suppliers. Alcatel, TellLabs, Motorola, and ADC were some of the companies that were awarded contracts to produce materials for the FTTP endeavor. With vendors lined up and on the same page, the telcos’ FTTP initiative was well underway when they received some good news. The Federal Communications Commission (FCC) ruled that this network upgrade was not subject to the unbundling requirements their copper plant faced. The RBOCs settled on a Passive Optical Network (PON) instead of the traditional Active Optical Network (AON) for their new fiber network. The electronics used to emit/receive the light wave signals and switching are housed in the central office and customer premise, and not in their outside plant infrastructure. Deployment and maintenance costs are lower because of the passive network. Fewer moving and electrical parts are needed to bring FTTP to the consumer. One downside to the PON structure is customers will be on a shared network for portions of the their loop as opposed to dedicated fiber strands on an AON or DSL configuration. But unlike sharing that bandwidth with 2500 other users, the fiber is split among only 32 customers. My main area of expertise is access design and engineering of Verizon’s FTTP deployment from the Central Office to the customer premise. I will briefly touch on the Central Office (CO) equipment and transmission but the bulk of my discussion will pertain to the outside plant configuration. The FTTP network utilizes lightwaves to deliver pulses through the fiber optic strands. Unlike electrical transmission systems that use frequencies in their bandwidth to segment services, FTTP uses three distinct wavelengths are to transmit/receive voice, data, and signal products. Wavelengths of 1310 nanometers (nm), 1490nm, and 1550nm carry upstream voice and data, downstream voice and data, and downstream video information, respectively. 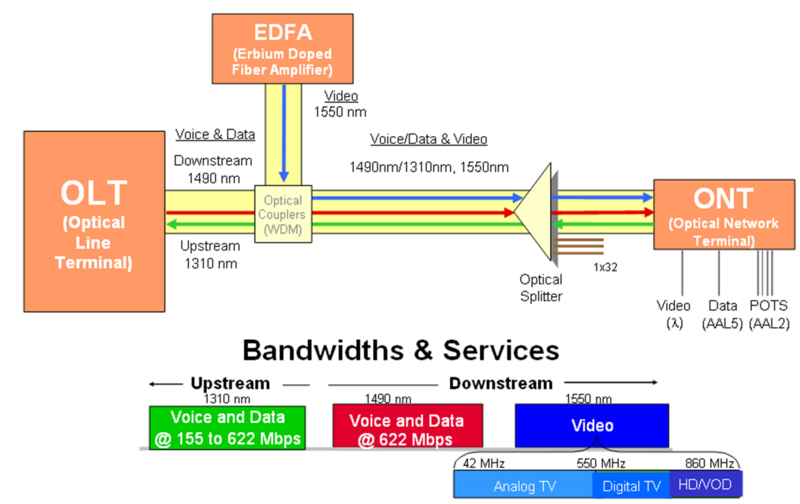 Inside the central office is where the Optical Line Terminal (OLT), Erbium Doped Fiber Amplifier (EDFA), and Wavelength Division Multiplexer (WDM) resides. The OLT converts digital data from the PSTN and Internet to light and the EDFA does the same for video signals received from the video head end. Both signals are then combined at the WDM before being sent to the outside plant over the fiber network. 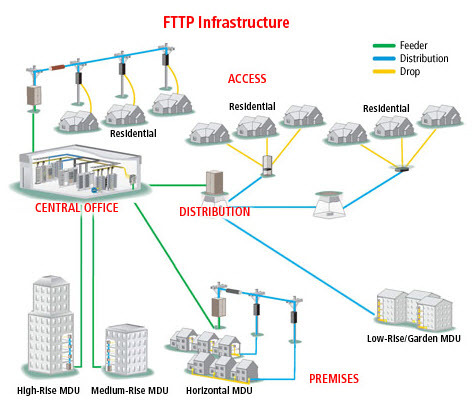 Connected to the feeder fiber cable is the Fiber Distribution Hub (FDH). Each FDH has the capacity to serve 32 to 432 customers. Inside each hub, optical splitters divide the light signal from the feeder fiber to be carried on the distribution network. Depending on the distance from the CO to the FDH, the feeder fiber is split either 16 or 32 ways. So in theory, you will only share a fiber connection with 32 customers at the most. The optical distribution network (ODN) consists of Fiber Distribution Terminals (FDTs), fiber drops, and Optical Network Terminals (ONTs). Fiber from the FDH is spliced into FDTs and fiber drops serve as the connectivity point from the FDTs and ONTs at the customer premise. In an overlay environment, the distribution network follows the existing path of the copper plant, meaning fiber will be overlashed to aerial cable if an existing pole line is present or pulled into existing conduit in an underground application. If the current copper plant is direct buried, then new subduct is bored to create a new pathway for the fiber. Each FDT serves 4 to 12 customers depending on design and preferred construction methods. In the single family overlay environment, all of the fiber cables and terminals are placed strictly in public right-of-ways (ROWs) or in public utility easements (PUEs). Only after an end user requests service is when the fiber drop is placed on private property. The final piece of the FTTP network and point of demarcation is the ONT. The ONT demultiplexes the optical signal and converts it into digital data for the home phone, data, and video network. 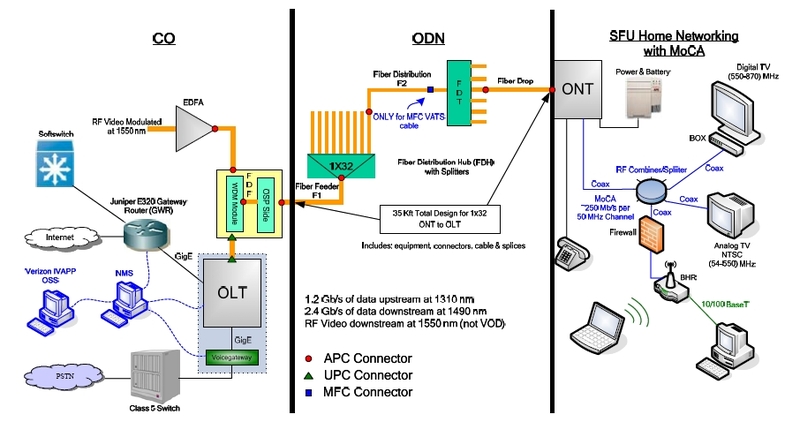 It also acts as a multiplexer when upstream traffic is carried back on the ODN to the CO. Each ONT is capable of providing two to four voice connections, one data connection over Cat 5 or coax cable, and one video connection over coax. The ONT requires power and this is the second and final time the PON architecture requires electronics. The ONT uses a power unit and battery back up unit to power POTS in case of a power outage. In a single family (SFU) application, the ONT and power/battery unit are separate. All in one enclosures that house both the ONT and power source are available for multi-dwelling unit (MDU) settings. When FTTP deployment started, the main focus was on single family living units. These units were defined as structures with less than four living units where telephony were provided via a decentralized system, meaning individual phone drops and network interface devices (NIDs) were fed from a terminal from an aerial lead or buried pedestal in the right-of-way or PUE and entered the units at different areas of the structure. 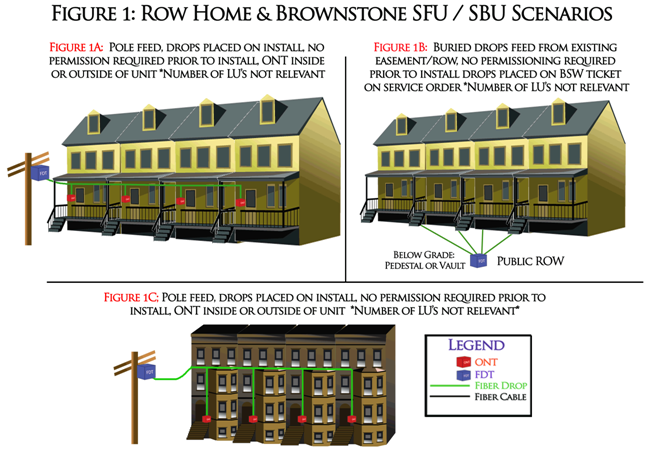 In this scenario, permission is not required before fiber drops are installed because the presence of a service order implies the homeowner giving consent to place the service drop. 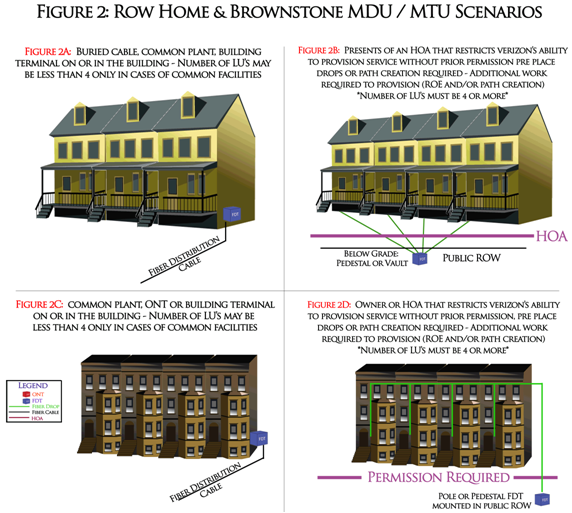 The problem with deploying to the MDU/MTU space is the issue of access. The FTTP overlay program passed fiber in front of each house or business (in the ROW or PUE) for FiOS capability without the need for permission. But in building out FTTP to the MDU segment, a different strategy is used. Since terminals are placed on each building in an apartment or condominium complex and not the ROW, access licenses are needed to upgrade existing facilities to fiber optics. Securing the access license is the first step before the property flows through to engineering. The main difference in MDU deployment is that the fiber service drops are installed at the time of construction and not on the service order. This saves time and provide economies of scale in order to roll out FTTP free of charge to property owners and management companies. Coordination is necessary to complete the upgrade project in an MDU setting. From the placement of the fiber terminal on the side of each unit or in its communications closet, fiber drops are then pulled into each and every unit in the retrofitting process. To do this, getting owner buy-in is crucial for the project to be successful. This is especially difficult in dealing with properties where units are individually owned, as in condos and townhomes. Most HOAs do not have the authority to grant access to every living unit on the property, which is a must to complete the retrofit stage. In instances where access to each living unit is not attainable or building layout is not conducive to retrofit, technology has made it able to feed the units utilizing a centralized ONT design. In this scheme, fiber drops are not needed as ONTs that normally reside in each unit are aggregated in one location and services are delivered through the existing inside wiring. 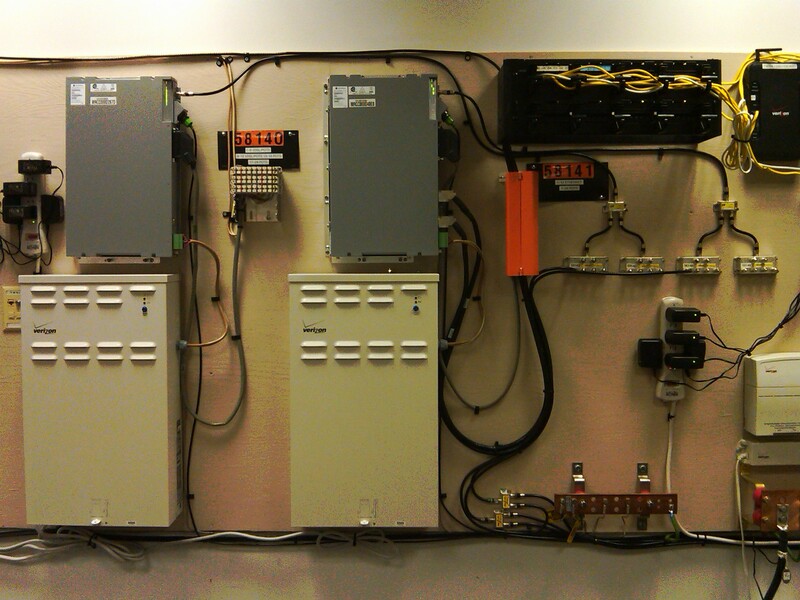 Now telephone rooms in most buildings cannot handle a wall of 8-12 ONTs, power supplies, and battery back-up units. Instead of using individual ONTs, a unit called an MDU-ONT or Multi-Customer ONT (MC-ONT) is deployed in such circumstances to feed the customers. The MDU-ONT deployment makes the most sense from an access and cost standpoint, but each property needs to be vetted to make sure the quality of the inside wiring is sufficient to carry the high speed information before this method is considered. Signal degradation can occur is specifications are not met. In summary, to combat access line loss and unbundling rules, increase broadband speeds, and become all-in-one advanced services providers, the legacy ILECs worked together to create specifications for new fiber optic networks to create a comparative advantage to prevailing MSOs and CLECs. FTTP or FTTX transformed the vision of the phone companies and positioned them as broadband and entertainment companies. Using PON technology and following their existing infrastructure, they were able to deploy FTTX fast and to a majority of their footprint. Whether providing services to single family homes or the MDU space, methods of construction may be different, but the technology remains the same. Bringing fiber optics the last mile will future-proof their networks for the many years to come. It creates a runway for broadband and IPTV needs of tomorrow’s connected home.